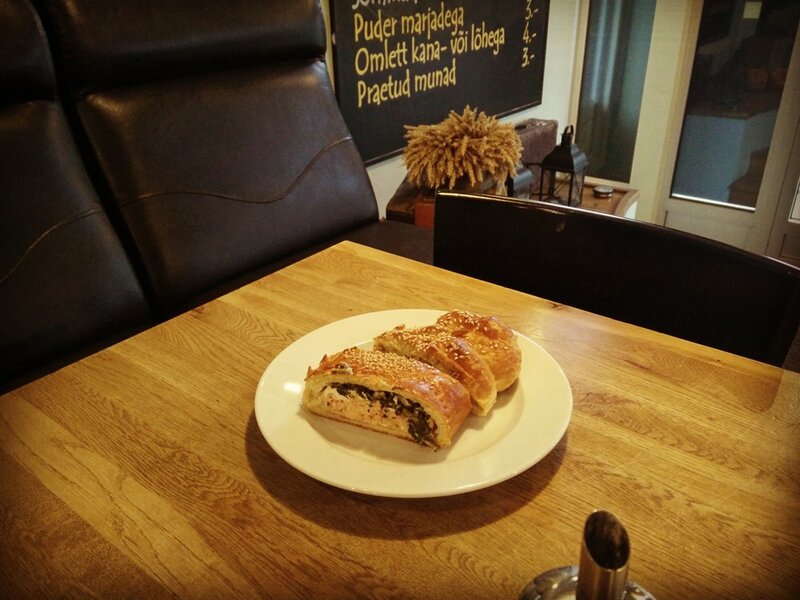 Tallinn cafe Bar-Buffeé Nikolay achieves the rare feat of fancifying its pastries without patronising its customers. There's no point in pretending Nikolay is a new place. It's not. In fact, when I first posted on Instagram how pleased I was to have found this exciting discovery, it took approximately ten minutes for a friend to comment that she had been there and, yes, the salmon and cream cheese pirukas (pastry, or "pie" from Estonian) was a particular favourite. However, while I feel like the guy who discovered The Strokes last of anyone in 2000, the feeling inside the cafe is much more 'Room on Fire' than 'Is This It?'. Nikolay has replaced a succession of old-school, no-frills cafes frequented by the long-term residents of the stretch of Gonsiori street going from the former Estonian Academy of Arts site to Politseipark. The owners of Nikolay have done their utmost to make the outside look attractive to passing custom, which is a lot more frequent and well-heeled now that the gleaming tart's boudoir that is the Hilton Hotel has sprouted opposite ERR (Estonian Public Broadcasting). With a sunny yellow logo in a scrawled typeface, Nikolay stood out well in the late-October Saturday gloom. The signature dish at Nikolay is the pastry, in various sweet and savoury varieties. While these snacks are available in Tallinn at virtually every street-corner kiosk, I hadn't tasted one made commercially with genuine care since my last time in a Cornish pasty shop in Birmingham. Consequently, the sheer breadth of choice available at Nikolay took me a bit by surprise. 45-centimetre-long new pastries emerged from the kitchen every few minutes, before being cut up into thin slices and served out to hungry punters. Trying the salmon pastry along with a turkey version, I got a picture of what happens when a simple idea is done as well as it can be. The pastry outer layer crackles in the mouth, while there is just the right amount of springiness from the dough. The turkey pastry I tried had been on display for a while and so was cold, but still piquant and moist. The salmon pastry was the real revelation, the fish together with the generous amount of cream cheese and sprig of spinach proving just as much as a delight for the senses as when it is all spread onto a bagel, as would be more usual. Like the premium burger places that have been multiplying all over Tallinn in recent years, the criticism will be that Nikolay takes simple, working-class food, and gentrifies it, before raising the price. This is partly true, but if you don't mind the quality of your pastry, there are still supermarkets and kiosks for you; Nikolay might charge a small amount more for its food, but what you get is clearly made with care, and is served up on the counter like a work of art. The 'Instagramability' of cafes is a key draw for potential customers, as a memorable picture on social media is the best marketing a cafe can get. Nikolay is a relatively recent addition to Tallinn's lunch scene, close to two hotels and a major business district, but along with location, good lighting and all the right angles, it's got the goods to keep people returning.